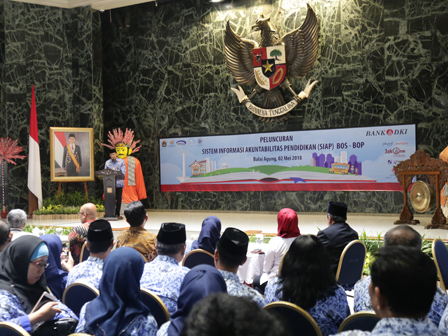 Jakarta Provincial Government launches Education Accountability Information System for School Operational and Education Operational Aid (SIAP BOS-BOP).
" SIAP BOS-BOP helps our management thus it can be more accountable and transparency in the future"
Jakarta Vice Governor, Sandiaga Uno said, SIAP BOS-BOP application is considered can support accountability and transparency on education fund management in Jakarta. "SIAP BOS-BOP helps our management thus it can be more accountable and transparency in the future. Besides, this application is also in accordance with Indonesia Bank program related to cashless transaction movement," he stated after SIAP BOS-BOP launching, City Hall, Wednesday (5/2). With cash management system (CMS) basis, it will be developed for presenting electronic service needs related to BOS and BOP fund management in schools, which is currently done manually. "Thus financial reporting system can be controlled easily and done in real time. We will keep support technology-based innovations," he stated. He added, it very supports Jakarta Government's vision and mission in presenting qualified and completed education. "Hopefully this application implementation can fulfill our hope in obtaining WTP opinion from BPK," he expressed.